D.Y. Jung, S. Tsutsumi (Japan), R. Sekel, R. Frost (Australia), K. Ikeuchi (Japan), and P.
387-061 Does the Minimum Energy Principle Govern Wrist Kinematics? 387-020 How Normal is Cartilage that Looks Normal? 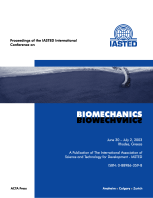 This publication covers the following topics: Orthopedics; General Biomechanics and Modelling; Cardiovascular System; The Spine; Gait and Motion Analysis; Injury and Rehabilitation; Sports and Performance; The Musculoskeletal System; and Tissues and Biomaterials.